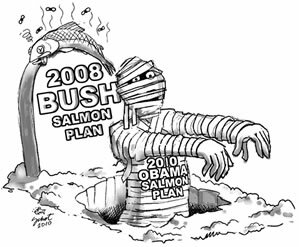 Snake River salmon are being strangled by hardball politics. The federal government, led by the Bonneville Power Administration (BPA), has control over the 31 federal dams in the Federal Columbia River Power System. BPA’s primary role is to market the electricity generated by the dams. But the BPA, and its federal agency partners, the Army Corps of Engineers and the Bureau of Reclamation, also are required to reduce the impacts of their dams to fish and wildlife. Two federal laws, the Endangered Species Act (1973) and the Northwest Power Act (1980), obligate the agencies to protect wild salmon and steelhead. However, preserving the federal power system is paramount to BPA. Northwest politicians and industrial users feel the same way. Utility companies, navigation and irrigation interests staunchly defend the status quo. The theory is that low power rates have fueled the Northwest economy for decades, especially since the hydropower system was constructed during the 20th century. Today, hydropower provides about 60% of the electricity consumed in the Northwest. With completion of Lower Granite - the last dam on the Snake River in 1975 - Lewiston became the furthest inland seaport in the Columbia River. Wild Snake River salmon and steelhead were first listed for protection under the ESA in 1991. Federal dam operators are required to account for the impacts of the dams on listed fish. Reams of paperwork have been created in the form of “policy plans and process” for endangered and threatened salmon and steelhead. But neither the plans, nor dozens of lawsuits have been able to force the BPA, BuRec or the Army Corps to significantly improve fish survival. We must do better. The National Marine Fisheries Service - the Obama Administration's salmon agency - determines the effects of the hydrosystem on fish through a legal document called the Biological Opinion (BiOp). The impacts to salmon from the federal dams have been debated in federal court for 20+ years. Much of the argument centers on the jeopardy standard found in the ESA -- whether the federal dams appreciably reduce the likelihood a population can survive in the short term and will achieve recovery within some identified time frame. The Courts have determined that in order to satisfy the recovery prong of this standard, NMFS must at least know “the in-river survival rates necessary to support recovery” before it can determine how the dams affect recovery. So far, however, the federal government has not come up with even a minimum survival standard let alone the survival rates necessary to allow fish to recover. Instead, the feds believe that all they must do is ensure that more fish come back this year than did last year, regardless of whether this would allow populations to recover in 100 or 1,000 years. Fish advocates sued the federal government, pushing them to come up with a scientifically sound jeopardy standard as well as many other things. Federal Judge James Redden ruled on the lawsuit in August 2011. He punted on resolving the issue of a jeopardy standard but stipulated the federal government has until January 2014 to revise the BiOp to show how improvements made in tributary and estuary habitat will avoid jeopardy by improving survival. Redden stepped down in late 2011 - Judge Michael Simon has taken the case.